Critical Connection is for middle-school parents who worry that their kids are slipping away from them. It helps them understand these turbulent years and know when to step in, when to step back, and what to watch out for. It is about screentime and smartphones, social lives and social media, how to encourage self-control and self-confidence, and how to guide kids towards career paths that will meet their needs and match their strengths. Critical Connection teaches parents how to build healthy families their 10-14-year-olds can rely on for safety, guidance, and unconditional love. People who loved Gary Chapman’s Five Love Languages of Children and Richard Louv’s Last Child in the Woods will love this book. Now available at Amazon.com, Barnes and Noble, and Apple iTunes. “I just finished reading Critical Connection. I can tell this is going to be a valuable resource now and as my daughters grow — I actually underlined a powerful insight on every single page of the book! Andy uses his own life experiences, as well as his experiences as a teacher and administrator, to help parents meaningfully connect with kids—even through the most difficult teen years. I have read a lot of parenting books, and this was by far one of the best. I hope lots of people purchase it. It is a powerful and priceless gift. I will recommend it to everyone I can.” – Rachel Macy Stafford, author of Hands Free Mama. 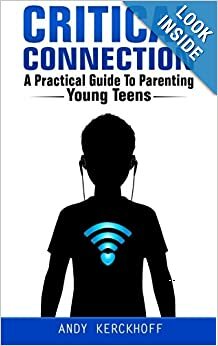 “I am a parent to three teenage children, and after reading Critical Connection, I sure wish I had this book a few years ago! It is a must-have for parents of young teens. This is an easy book to recommend to others. I look forward to not only reading it through again to glean more ideas, but also to purchasing copies for friends who would appreciate the encouragement and challenges.” – Mike Weinberg, author of New Sales. Simplified. The Charlie Brennan Show on KMOX 1120AM in St. Louis. I actually underlined a powerful insight on every single page of the book! I cannot put this book down. I am reading and reading. Having so many “aha” moments. It is encouraging, thought-provoking, and challenging. It didn’t make me feel like an idiot. It’s the best parenting resource I have read in three decades! The honest approach that the author has that this is not meant to be the perfect “how to” guide had me hooked from the beginning. The messages will resonate with you long after you put it down. I have read a lot of parenting books and this is one of the best. The advice is spot on and addresses issues that are current and relevant. Critical Connection is the best book I have read on the subject of parenting middle school teens.